Singapore’s oldest church, the small, white Armenian Church was built way back when in 1835, making it not just the oldest church in Singapore but one of the city’s oldest still standing buildings. Browse places to stay in Downtown Singapore on Agoda.com. Free cancellation. 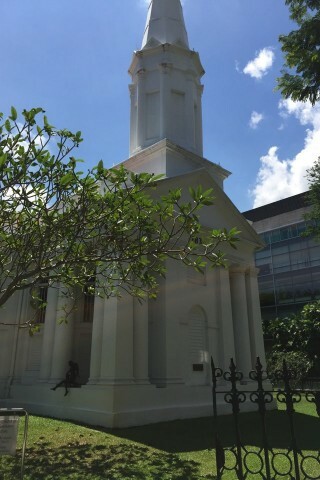 At the time of the construction, Singapore was home to just 12 Armenians, but with funds raised from Armenian communities in India and Java -- along with European and Chinese residents of Singapore -- the church was built between 1834 and 1835 by GD Coleman. The church was consecrated on 26 March 1836. Originally the church had the domed roof and bell turret typical of Armenian architecture, but they were removed for structural reasons and switched to a pitched roof and spire in 1853. Singapore’s Armenian community was never very large but they were influential and included families such as the Sarkies borthers (who established Raffles Hotel) and Catchick Moses, the co-founder of The Straits Times newspaper. Behind the church you’ll see a small cemetery with some interesting tombstones, including one to "Baby Sarkies" who was born on 20 October 1943 and passed away the same day. The grounds also house some unusual sculptures of Jesus carrying the Cross and angels perched on the church verandas. You’ll find Singapore’s Armenian Church on Hill Street, just around the corner from the Peranakan Museum on Armenian Street. The closest SMRT is City Hall.